I did not care to learn how to make carrot recipes when I was young. There have always been very few foods which I was not interested in preparing including all the vegetables. For me, cooked carrots always had such an awful taste. As a child when we had to eat this vegetable in elementary school I would “gag” trying to get them down even though I loved them when raw. Every spring when it came time to plant our garden, carrots were automatically included in the vegetable “lineup”. That was OK with me because I loved them fresh out of the garden. As far back as I can remember, Mom would tell me how important it is to eat plenty of carrots. She would run through all the many health benefits including how good they are for your eyes. Maybe if I had liked cooked carrots better my eyes would be better now! Anyway, we were never without carrots in our refrigerator. Well, the years have changed my taste bud! I now have learned how to make carrot recipes of all kinds. I learned how to add all kinds of spices and herbs to make very flavorful dishes. I really wanted my children to like eating carrots, both fresh and cooked because of Mom’s words on health. I was always so thankful that they loved this vegetable no matter how I served them. Some recipes even include sugar and honey which does add a lot of calories but oh, so good. I would have never thought all my carrot recipes possible years ago. Back then, it was usually only butter, salt and pepper on cooked carrots. The first time I tried honey carrots, I was amazed! This reminds me of my husband. I attended a banquet dinner with him when we were still very young. He was not familiar with too many vegetables. We were served honey carrots for dinner. John said quite loudly” These are the best sweet potatoes I have ever eaten!” Everyone there laughed! Of course, everyone except John knew they were carrots. If you grow your own garden, you can sow carrots in the spring and summer. These multiple plantings allow you to have fresh carrots almost all year round for learning how to make carrot recipes. You can pull up the carrots as you need them for use. They can also be harvested and then stored in the ground through the winter months. This is done by layering them with hay or straw. Keep fresh carrots in your refrigerator for convenience to eat raw or in carrot recipes. If you are learning how to make carrot recipes, you will see that many can be made with fresh carrots and require no cooking. 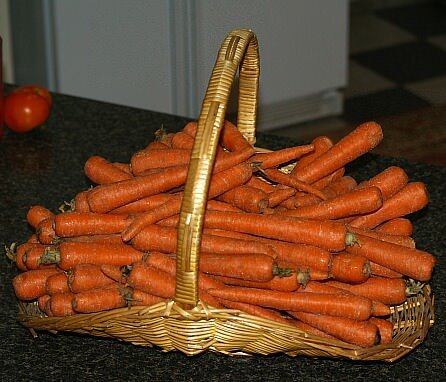 I use carrots in many of my salad recipes. Not only do carrots add flavor to these salads but also add “spark” to the presentation. The same goes when making many appetizers; I love adding a few slivers of shredded carrots on top of small appetizers. There are also many carrot recipes using fresh “raw” carrots in combination with other ingredients. After combining, the recipe is then cooked or baked all together like many of my cakes. Sometimes, you will be instructed also to use cooked carrots in the recipe. These could be chopped, sliced, diced or in the form of carrot puree. Sauté onion and garlic in olive oil in a large saucepan for 5 minutes while stirring. Add fennel and carrots and cook 2 minutes longer. Add 1 teaspoon fennel seeds, wine salt and broth; simmer for 50 minutes until very tender. Add vinegar to the mixture; puree mixture in batches in a processor or blender. Season soup with black pepper. Toast remaining fennel seeds in a small dry skillet until slightly brown. Sprinkle seeds on tops of bowls of soup to serve. This is one of the carrot recipes with more calories but so worth it. These moist muffins are filled with sweet raisins and carrots; delicious anytime of the day. In another bowl combine eggs, honey, yogurt, oil, lemon juice and vanilla. Stir egg mixture into dry ingredients just until blended. Fill paper lined muffin cups 2/3 full; bake 20 to 25 minutes or until pick comes out clean. Cool in pan 5 minutes and then remove from pan to cool completely on rack. 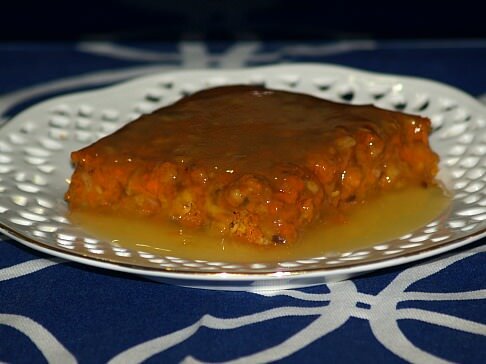 CARROT PUDDING RECIPE a tasty carrot recipe treat! Sauté onions in melted butter for 5 minutes. Add rice and broth; cover and simmer for 10 minutes. Add carrots, tarragon, salt and pepper; cover and cook until rice and carrots are very tender. Preheat oven to 375 F degrees; grease 1 quart baking dish and set aside. Process or blend carrots and rice until smooth; if mixture is too thick add a little milk while processing. Put blended mixture into a large bowl. In a clean bowl beat egg whites until stiff but not dry. Gently stir beaten egg whites into pureed mixture; transfer to greased baking dish. Bake for 30 minutes or until puffed and golden brown. Preheat oven to 325F degrees; lightly oil 1 ½ to 2 quart casserole dish. Combine ¼ cup of oil and brown sugar; add apple juice and egg whites mixing well. Combine oat bran, flour, baking powder and cinnamon; add to oil sugar mixture. 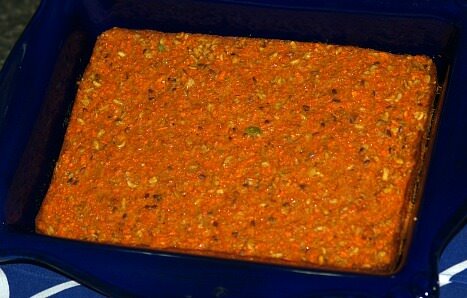 Add and stir in carrots; pour into prepared baking dish. TO MAKE LEMON SAUCE combine sugar and cornstarch gradually add hot water mixing to dissolve sugar. Cook over medium heat about 3 minutes stirring constantly until thickened and clear. Remove from heat and stir in butter, lemon juice, lemon peel and food coloring. Cool slightly; spoon 2 tablespoons over each serving. Serves 8.